Henry Dobson, lawyer, premier, and federationist, was born at Hobart on 24 December 1841 to John and Kate, née Willis. Henry grew up in a family of lawyers and politicians. His father, a brother and two half-brothers all practised law, and all but the father gained election to either the Tasmanian or Victorian Parliaments. Dobson was educated from the age of nine at The Hutchins School in Hobart. He was employed by the Hobart firm, Samuel Moses and Company, after which he undertook legal training. In 1864, he was called to the Tasmanian Bar. Following a legal partnership with W. R. Giblin (Premier of Tasmania, 1879–84), he became a member of the prominent Hobart firm of Dobson, Mitchell and Allport, practising until his death, and earning a reputation in Tasmania as ‘among the most trusted of family lawyers’. In 1893, the Australasian wrote of the ‘very highest esteem’ in which Tasmanians held the Dobson family. Dobson was elected to the House of Assembly for Brighton in a by-election in August 1891, having stood unsuccessfully in the South Hobart electorate in the May election. Dobson made sufficient impact as a member of the emerging opposition to the liberal Fysh Ministry (1887–92) to ensure that by the end of September he was Leader of the Opposition. Beset by various crises, Fysh resigned in August 1892 and Dobson formed a conservative administration. The Dobson Government’s prescription of wide retrenchments and sweeping economies as a means of dealing with Tasmania’s parlous financial position soon earned much criticism and was rejected by the Parliament. Following the election in December 1893, Dobson, whose policies were already at odds with those of the Legislative Council, found his parliamentary numbers weakened. He resigned following the defeat of his Land Tax Bill in April 1894. Dobson continued as Member for Brighton. Earlier, he had opposed an excess of ‘party government in a small community’, as he wanted to be untrammelled by a ‘rigid adherence to any party’. He did not stand for the 1900 election for the House of Assembly, but in 1901 successfully contested the first Senate election. Like a number of others in the first Parliament, Dobson was rewarded for his support of Federation. In the first Senate election, he came fourth amongst the Tasmanians, and was described as a ‘fluent, enthusiastic speaker of the Deakin order’. When he was re-elected in 1903, he was in first position, but lost his seat in 1910. Dobson was hard working and revealed an ability to contribute on a range of topics, including matters relating to appropriation, excise, treaties, customs, trade marks and conciliation and arbitration, invalid and old-age pensions, and, in September 1901, a private members’ bill on divorce. Dobson won himself a name as a politician who, when he rose to take the floor, was worth listening to, though his Labor opponents often found his conservative views confronting, especially when he defended the rights of capitalists against the demands of the workers. He was particularly critical of the tight control the Labor Party exerted over its members, and he warned that ‘this system of machine-politics, if not checked, will drag us all over the precipice’. For a brief period in June 1901, Dobson filled the position of Chairman of Committees on a temporary basis. Dobson spoke often on the federal system. He continued to advocate a strong Senate, and wanted to see the chamber have its fair share in initiating legislation. He corresponded on parliamentary matters with both Deakin and Senator Symon, once confessing to Symon that he had difficulty in remaining ‘silent’ when ‘we have in the Senate so little to do with the making & unmaking of governments’. He was concerned to protect the states. He thought Tasmania had the most to benefit from free trade and would later claim that it was primarily interstate free trade anddefence considerations that ‘led us to vote for the Constitution’.He criticised the Defence Act as ‘defective’ and the Commerce Bill for dealing only with foreign and not interstate matters. He argued consistently against the Inter-State Commission and as early as 1906 was concerned that ‘every fresh power exercised by the Federal authorities is exercised at the cost of additional expenditure’ that could be helping the state budgets. He was an enthusiastic advocate of the per capita grants introduced at the end of the first decade to ease the states’ financial burdens. For Dobson, government activity had to be conducted with due attention to economy, a view he expressed as premier and as senator, and he was ever ready to seek economies and to reduce government outlays. A favourite target was the soon-to-be-built national capital, which he described as ‘the last thing’ necessary and which he believed should be established in Sydney. It was, he thought, inconceivable that a nation with a small and stagnant economy should be planning to spend millions to establish the capital outside its major city. In his view, the Constitution needed amending to that end. He also attacked the creation of the position of High Commissioner in London: ‘No one man … could do any more good than the six Agents-General can do’. To Dobson, ‘Imperial federation’ was ‘far more momentous’ than ‘even the Australian federation’. In one memorable speech, he stated that the English Labour politician, Keir Hardie, deserved hanging for various ‘mischievous, unpatriotic, and traitorous’ speeches made in India on the subject of Indian self-rule. On 4 February 1868, Dobson married Emily Lempriere at the Bothwell United Church of England and Ireland. Emily became influential in the Tasmanian women’s movement. The Dobsons, who had two sons and four daughters, were active in many philanthropic activities in southern Tasmania. Henry was a supporter of the free kindergarten movement, a temperance advocate, a co-founder, with Giblin, of the Hobart Working Men’s Club in 1864,and a member of the National Council of the Anti-Sweating League of Victoria.He was also active in the Hobart Debating Society. He took a keen interest in education issues, including school attendance, night schools and compulsory education, the latter being one of his achievements in the Assembly. In 1893, Henry and Emily helped fund, and would continue to work tirelessly for, the Southport village settlement scheme for the Hobart unemployed. Elements in the Labor Party referred to this scheme, which collapsed in the face of intractable problems, as ‘Dobsonia’. 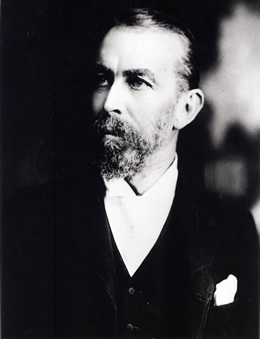 Dobson’s special interest was the development of Tasmanian tourism, and for a time he was president of the National Park Board and the Tourists’ Association of Tasmania. In the latter role he had, in January 1902, given evidence to the Senate select committee on steam-ship communication between Tasmania and the Australian mainland—a matter of some importance to Tasmanian senators. Something of an environmentalist, Dobson also worked to protect Tasmanian beauty spots and furthered the development of tourist drives around the capital, the best-known of which ran to The Springs on Mt Wellington. In 1913, he addressed the Field Naturalists on the subject of fauna protection. Henry Dobson died in Hobart on 10 October 1918, and was buried in Queenborough cemetery, one son having predeceased him. Dobson had regarded parliamentary activity as a service which men of his standing had a duty to perform. The Hobart Mercury wrote that he was ‘a man of strong mind and will, sticking tenaciously to his convictions, to which he could give eloquent expression’. E. M. Dollery, ‘Dobson, Henry’, ADB, vol. 8; The Cyclopedia of Tasmania, vol. 1, 1899, Maitland and Krone, Hobart, pp. 60, 62, 126–127, 129–130, 297; The Hutchins School Centenary Magazine 1846–1946, Hobart, 1946, pp. 70, 77; Mercury (Hobart), 11 October 1918, p. 5; Australasian (Melbourne), 1 July 1893, p. 34. Terry Newman, Tasmanian Premiers 1856–1988: A Biographical Handbook, Tasmanian Parliamentary Library, Hobart, 1988, p. 41; F. C. Green (ed. ), A Century of Responsible Government 1856–1956, Government Printer, Hobart, 1956, pp. 188–192; W. A. Townsley, Tasmania: From Colony to Statehood 1803–1945, St David’s Park Publishing, Hobart, 1991, pp. 170–171;Lloyd Robson, A History of Tasmania. Volume II, Colony and State from 1856 to the 1980s, OUP, Melbourne, 1991, pp. 54, 178; P. Weller, ‘Groups, Parliament and Elections: Tasmanian Politics in the 1890s’, THRAPP,vol. 21, June 1974, pp. 89–103; Punch (Melbourne), 7 December 1905, p. 812; P. F. Bolger, ‘The Southport Settlement’, THRAPP, vol. 12, April 1976, pp. 99–113. Journals and Printed Papers of the Federal Council of Australasia, Government Printer, Tasmania; Alfred Deakin, ‘And Be One People’: Alfred Deakin’s Federal Story, with an introduction by Stuart Macintyre, MUP, Carlton, Vic., 1995, p. 73; AFCD, 13 April 1897, pp. 529–534, 15 April 1897, pp. 670–671, 14 September 1897, pp. 517–520; Mercury (Hobart), 1 January 1901, p. 3. Table Talk (Melbourne), 25 April 1901, p. 14; CPD, 11 September 1901, p. 4668; Geoffrey Sawer, Australian Federal Politics and Law 1901–1929, MUP, Carlton, Vic., 1956, p. 72; CPD, 10 October 1902, p. 16729, 9 March 1904, pp. 277–288, 22 May 1901, pp. 153–164, 4 October 1906, p. 6055; Letter, Dobson to Deakin, 4 July 1905, Deakin Papers, MS 1540/15/378, NLA; Letter, Dobson to Sir Josiah Symon, Symon Papers, MS 1736/10/471, NLA. CPD, 26 October 1904, p. 6058; Mercury (Hobart), 2 March 1901, p. 4; CPD, 9 March 1904, p. 287, 8 November 1905, p. 4688, 22 May 1901, p. 159, 9 March 1904, p. 281, 10 October 1906, p. 6338, 27 August 1909, p. 2727, 9 March 1904, p. 286, 14 June 1906, pp. 192–193. CPD, 22 May 1901, p. 156, 4 October 1907, p. 4245; Dollery, ‘Dobson, Henry’, ADB; I. A. Reynolds, ‘Dobson, Emily’, ADB, vol. 8; Bolger, THRAPP,April 1965, p. 111; Mercury (Hobart), 19 February 1909, p. 7, 1 November 1899 (supp. ), p. 2; THA, Journals, 7 July 1898; Papers and Proceedings of the Royal Society of Tasmania for 1918, pp. 75, 144; CPP, Report of the select committee on steam-ship communication between Tasmania and mainland Australia, 1902; Robson, A History of Tasmania, pp. 69, 232, 283–285, 291. CPD, 26 October 1904, p. 6060; Mercury (Hobart), 11 October 1918, p. 5. This biography was first published in The Biographical Dictionary of the Australian Senate, vol. 1, 1901-1929, Melbourne University Press, Carlton South, Vic., 2000, pp. 227-230.